The Kintyre Forum • View topic - Does anyone know? 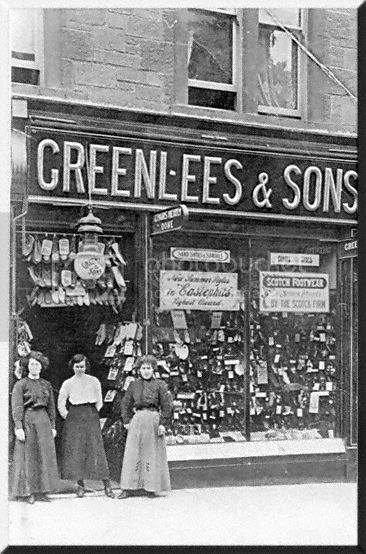 Can anyone help me - I have an old picture of Greenlees Shoe Shop, but I am wondering where in Campbeltown it was situated. Thanks Johnny for your help in talking me through how to put a photo on to my file - told you I was thick! Last edited by SouthendLass on Fri Jan 31, 2014 3:12 pm, edited 1 time in total. Greenlees was a shoe shop on The Main Street. Hodge's on the corner of Longrow South/ Main St. followed by Greenlees. Catherine has reminded me that Greenlees became Easiphit. Lately it would have been The Chocolate Box. Last edited by bill on Fri Jan 31, 2014 11:30 pm, edited 1 time in total. Thanks for your help Bill - that's great. It was no. 28 Main St. There are a couple of (I think) interesting bits in this photo. Is that a gas light over the door? I can see the name Easiphits on the poster in the window, but cant make out what it says. The other poster has the words "Scotch footwear by the Scotch firm" surely not written by a Scotsman/woman/person or was it usual back in the day? I remember the Main St used to have the sunscreens above the shops pulled down quite a lot then (might be my memory playing tricks). Was that the start of global warming? Would the shameless hussy with the miniskirt be the boss? Bought ma Fitba boots there once ! Didn't do me any good mind ! Not old enough to have used Greenlees but remember getting Tuf school shoes. I am sure they had animal paw prints on the sole and a compass hidden in the heel. The height of fashion at the time. I remember these shoes. I think they were called Wayfinders. Round about the same time there was the winklepickers. I've not been on the forum for a while and have just noticed this. What an absolutely fabulous photograph. Ive been trying to make out what the sign says at top of pic just below the "L. Could it be "repairs neatly done".A gem of a pic. Thanks Bill. A gem of a photograph and jeezo what a window display!